If you liked The Passion, then you won’t want to miss the Via Cruz, the Way of the Cross, on Good Friday, March 25 starting at 12 noon from St. Casimir church. 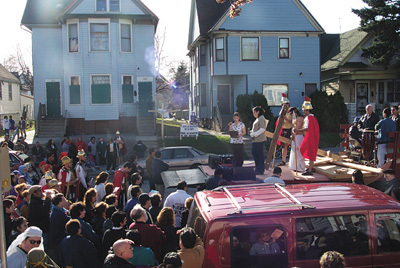 A real-life tableau complete with people in costume is situated on a flatbed truck, which winds its way from St. Casimir’s on Clarke Street to St. Francis church on 4th and Brown Streets. The procession and accompanying choir stop at participating houses, where people recite prayers relating to a particular stage of Jesus Christ’s suffering and death. Current events as well as local issues are also integrated into the ceremony. The event is bilingual, alternating in Spanish and English at every other house, or “station.” This tradition has been a part of the north side community for at least five years — rain or shine. Father Gerry Hessel, of St. Casimir’s parish, has offered up many prayers for the man portraying Jesus, who wears only a loincloth in the sometimes very harsh elements. The procession, a custom in most Spanish-speaking countries, is made as realistic as possible in order to make it more effective as an evangelical tool. It often inspires people to “practice their faith, especially those who have fallen away from the church,” Fr. Hessel explained. The event serves as a “day of reflection, to meditate on what Christ went through in order to save us.” Fr. Hessel feels that the procession emphasizes the “importance of the redemptive acts of Christ,” – i.e. – “His death and resurrection.” Via Cruz has also been a fixture of the south side community for more than 15 years, taking place along Mitchell Street from St. Anthony’s to St. Vincent church. For more information, contact the Hispanic Ministry Office at 769-3398.